“Weaver’s secret log 52: “Anthrax also knows how the rankings here are, he said he could get me to Virgula one day, maybe even Gladius at some point? Wouldn’t that be exciting? Really funny the fact that she loves snakes, even when snakes (if i remember correctly) hunt foxes. Anthrax is an arcane, arcane are above the 5 ranks listed. Above him is the captain rank and above that is EMajor herself. 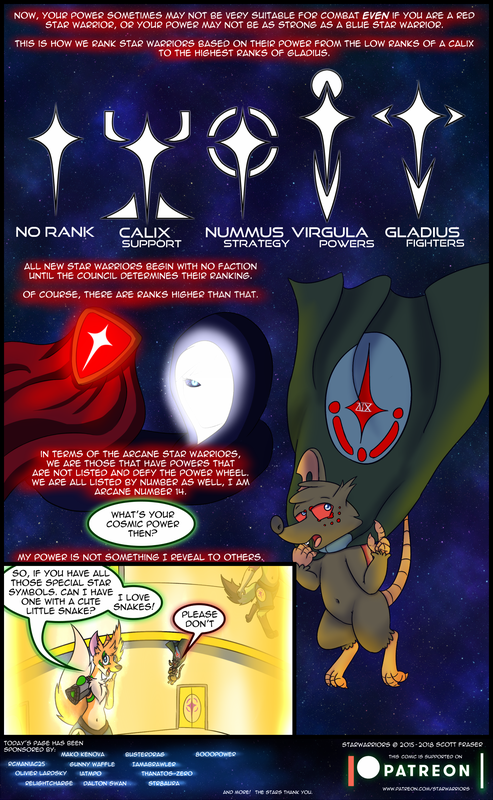 If you go to https://www.starwarriorscomic.com/starwarrior-creation-guide/ and scroll down to “the Stellar Order” section it describes the ranks in more detail. I think this part in the story is more to show Esmeralda’s beginning days as part of the star warriors, as well as a nice tie-in for Anthrax’s backstory. The only NEW data we as an audience have received, in this arc regarding the star warriors themselves, is how the cosmic flow color is associated to there emotion. This had not be covered so far and explains a few things hinted on in the past. Can extraterrestrials become Star Warriors?